The center stone is the most beautiful blue color. 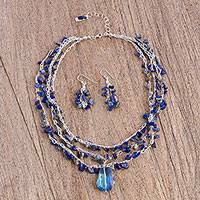 The sterling silver really adds to the beauty of the necklace. 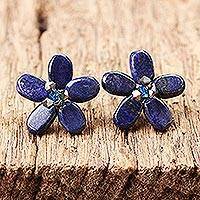 The earrings are small but nice. 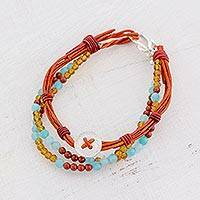 great with white blouses too! 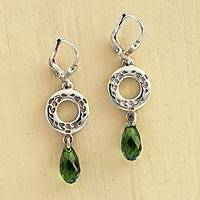 These earring are stunning...beautiful emerald colored crystals hanging from sterling silver circles that are engraved with the words friendship love and loyalty. The have lever backs which I love , less chance of loosing them!! My only complaint is that they are now on sale!!! 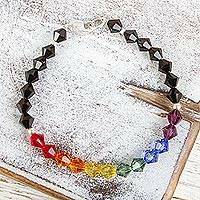 They are quit lovely, and I have ordered from Novica a few times and all the jewelry has arrived quickly and with excellent craftsmanship .loved every piece. 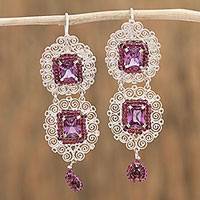 Garnet and Crystal Dangle Earrings from Mexico, "Red Coquetterie"
Sterling Silver Heart Embedded Crystals Pendant Necklace, "Love's Desire"
Mexican artisan Dalia Pascal handcrafts a lovely sterling silver heart pendant bejeweled with crystals. 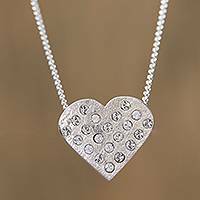 The heart pendant hangs from a sterling silver cuban link chain. 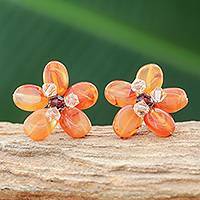 Carnelian Button Earrings Handmade in Thailand, "Honey Flower"